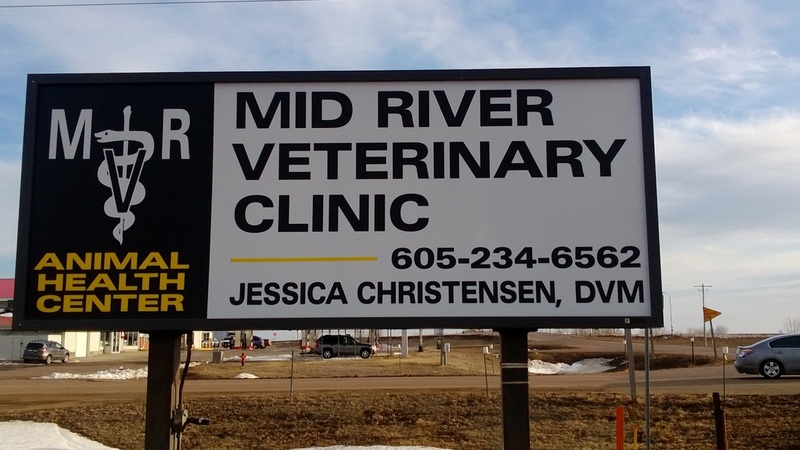 Mid River Veterinary Clinic (MRV) is a full service veterinary clinic providing services for large and small animals. Our motto is "Supporting Quality Animal Health, from Pet to Pasture." We are here to help you provide the best care for your animals - questions, services, products, and more! ​We take pride in serving our community and surrounding areas (Reliance OutReach Program), and enjoy getting involved in community activities (parades, River City Friday Nights, and more)! MRV was purchased in 2013 and has been steadily growing ever since. Dr. Jessie Christensen is our veterinarian, and enjoys working on animals of all sizes. Our support staff includes Danessa, Crystal, and Ira. We work together to build solid, trustworthy relationships with all our clients and patients. Through our expansion, we have provided care to cattle, dogs, horses, cats, sheep, goats, pigs, rabbits, guinea pigs, tarantulas, birds, fish, and we've recently added Bees to our list (and even the Circus!). We love providing quality care to all of our patients, and working with their devoted owners. Part of providing quality care involves updating our facilities and equipment. Since the acquisition of MRV by Dr. Christensen, the clinic has undergone cosmetic upgrades, equipment upgrades, and added new services. ​"I am so happy with Mid River Vet. Oreo is our first pet and I I went to Chamberlain Area Moms on facebook when we got her and you were recommended. I am very happy every time we go there.They always treat her as if she is their own puppy. Thanks!" - Tami and "Oreo"